Seasoning liquid made from salting and fermenting a variety of small fish. After allowing the fish to decompose in the sun, typically in large clay jars, the resulting liquid is filtered and bottled. It is dark brown in color, smells strongly of fish and is very salty. Vegetarian versions made from soy are available as well. Fish sauce is a key ingredient in Southeast Asian cuisines, especially in Thailand and Vietnam. It pairs very well with lime juice. Buying: Available at most large grocery stores in "ethnic" sections. No preparation required. Common recipes calling for fish sauce are: Pad Thai, Curried Noodles, Chicken Basil, and Fried Rice. 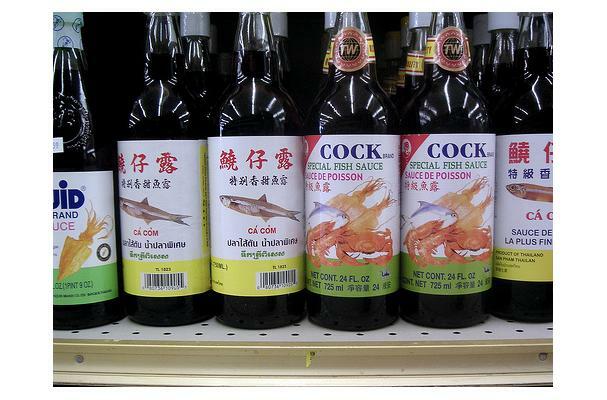 It's recommend to use less fish sauce than more when unsure due to it's strong flavoring. Can be stored in cupboard. History: Fish sauce has a long unwritten history for centuries in Vietnam. Many of the secrets of making of fish sauce are traditional family histories from parts of Vietnam in Phu Quoc and Phan Thiet, both are most notable for there quality.